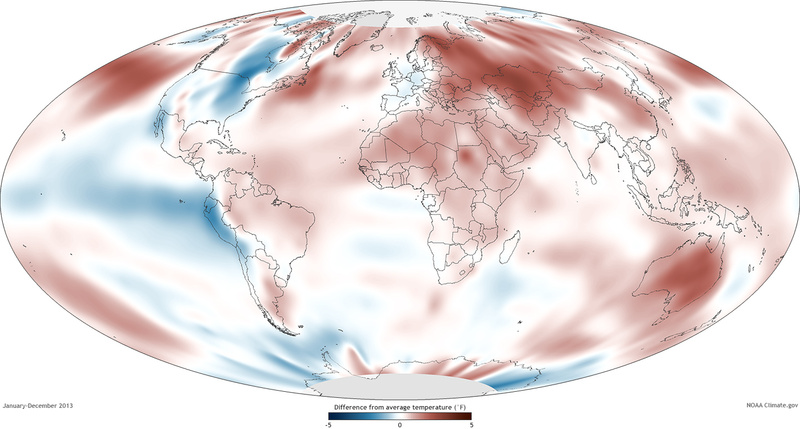 Scientists from NOAA’s National Climatic Data Center in Asheville, N.C., served as the lead editors of the report, which was compiled by 425 scientists from 57 countries around the world (highlights, visuals, full report). It provides a detailed update on global climate indicators, notable weather events, and other data collected by environmental monitoring stations and instruments on air, land, sea, and ice. 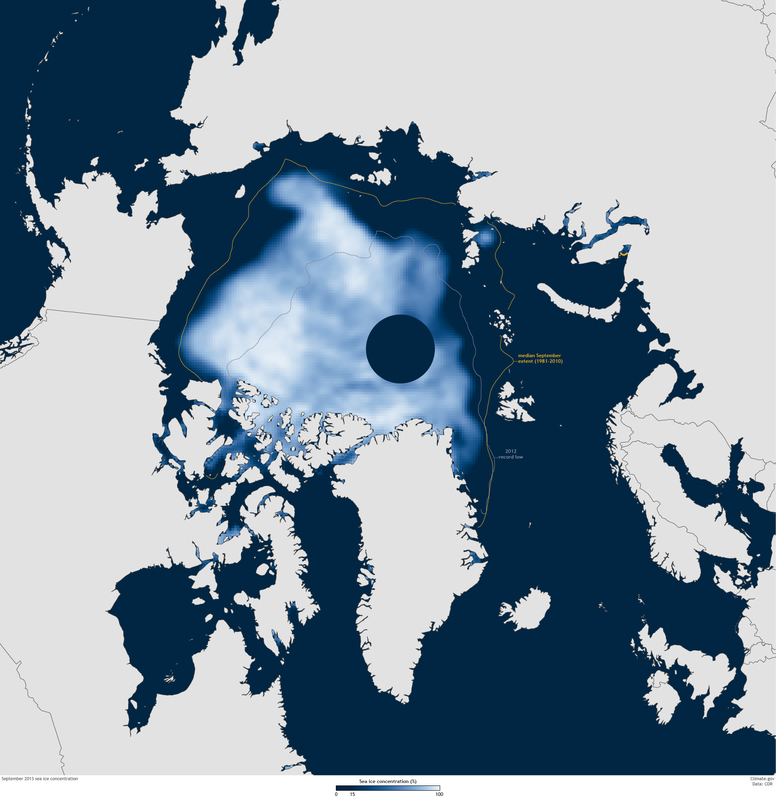 The report uses dozens of climate indicators to track patterns, changes, and trends of the global climate system, including greenhouse gases; temperatures throughout the atmosphere, ocean, and land; cloud cover; sea level; ocean salinity; sea ice extent; and snow cover. These indicators often reflect many thousands of measurements from multiple independent datasets. The report also details cases of unusual and extreme regional events, such as Super Typhoon Haiyan, which devastated portions of Southeast Asia in November 2013. Atmospheric carbon dioxide concentrations in parts per million for the past 800,000 years, with the 2013 annual average concentration as a dashed line. The peaks and valleys in carbon dioxide levels follow the coming and going of ice ages (low CO2) and warmer interglacials (higher CO2). Graph by NOAA Climate.gov, based on EPICA Dome C data (Lüthi, D., et al., 2008) provided by NOAA NCDC Paleoclimatology Program. Surface temperatures in 2013 compared to the 1981-2010 average. NOAA map by Dan Pisut, NOAA Environmental Visualization Lab, based on Merged Land and Ocean Surface Temperature data from the National Climatic Data Center. Adapted from Plate 2.1(c) in State of the Climate in 2013. Annual sea surface temperature compared to the 1981-2010 average from a variety of sources. Despite year to year variability, all the years in the past decade have been warmer than average. Sea surface temperature in 2013 compared to the 1981-2010 average. 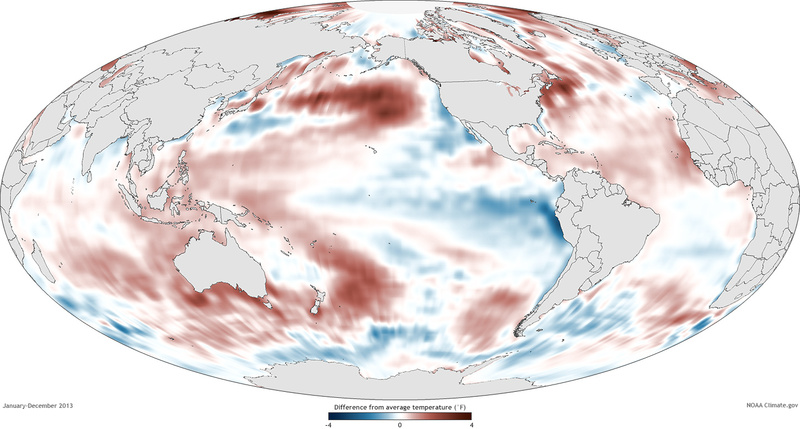 The dark red and blue areas reveal areas of the global ocean that were up to 4º Fahrenheit warmer or cooler than average. Map by Dan Pisut, based on NOAA OISST data. Adapted from Figure 3.1(a), in State of the Climate in 2013. Sea surface temperatures increased: Four independent datasets indicate that the globally averaged sea surface temperature for 2013 was among the 10 warmest on record. 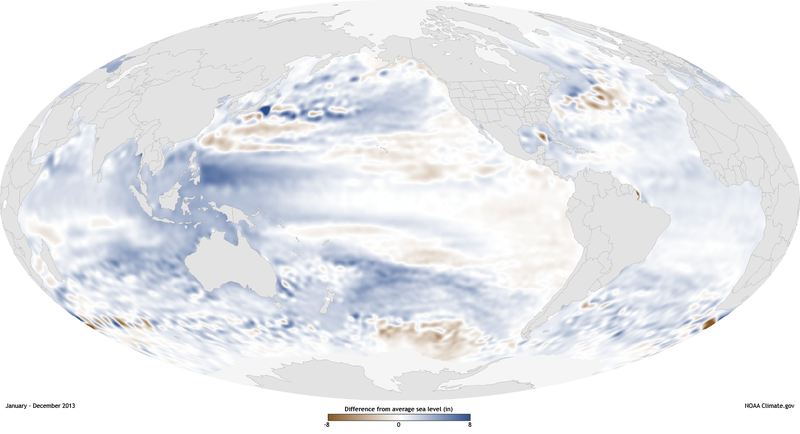 El Niño Southern Oscillation (ENSO)-neutral conditions in the eastern central Pacific Ocean and a negative Pacific decadal oscillation pattern in the North Pacific. The North Pacific was record warm for 2013. Global sea level from 1993 through 2013 compared to 1993-2012 average, based on AVISO data. Graph adapted from Plate 1.1, panel v, in State of the Climate in 2013. The map shows where average sea level in 2013 was above or below its long-term average. Places where sea level rose up to 8 inches higher than the 1993-2010 average are dark blue, average levels are white, and places where sea level fell below average are brown. Map by NOAA Climate.gov, based on AVISO data provided by Mark Merrifield. Adapted from Figure 3.28(a) in State of the Climate in 2013. Difference in ice extents for each year’s maximum (March, purple line) and minimum (September, blue line) relative to the 1981-2010 average. Graph adapted from Figure 5.13 in State of the Climate in 2013. Sea ice concentration in September 2013 compared to the median extent from 1981-2010 (gold line) and the 2012 record low (gray line). Map by NOAA Climate.gov, based on data provided by the National Snow and Ice Data Center. Adapted from Figure 5.12(b) in State of the Climate in 2013. 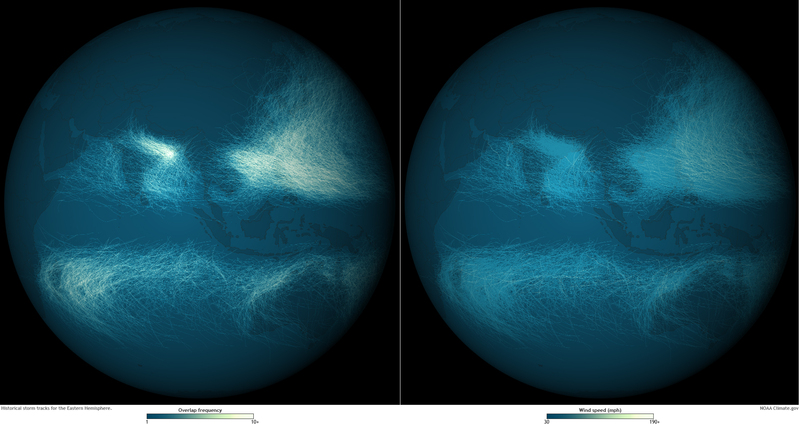 Tracks for the thousands of Eastern Hemisphere tropical cyclones documented in the International Best Track Archive for Climate Stewardship database for 1842-2012. Rarely do storms form within ~5° of the equator. Map by Dan Pisut, NOAA Environmental Visualization Lab. State of the Climate in 2013 is the 24th edition in a peer-reviewed series published annually as a special supplement to the Bulletin of the American Meteorological Society. Do you remember the villain's secret island hideout in the latest James Bond movie Skyfall, the one that looked like a decaying industrial wasteland? 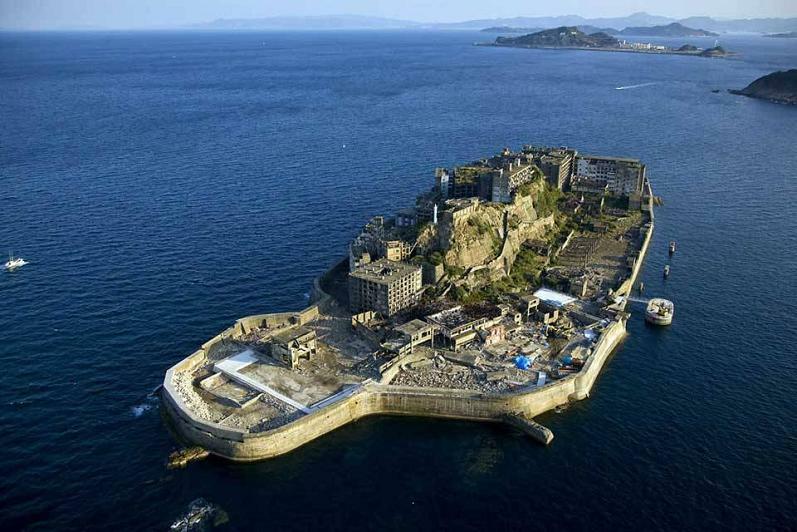 That fictional location was actually based on a real place — the island of Hashima off the coast of Nagasaki Prefecture in Japan. Due to its unique flat shape, the island is most widely known in Japan by its nickname Gunkanjima — aka "Battleship Island." Starting in the late 19th century, Hashima served as a coal mining facility and residential complex for 5,000 people. After the decline of coal mining in the 1970s, however, the island became completely abandoned, only opening up again to tourists in 2009. Hashima has transformed into an eerie tourist destination where you can see a once thriving town decaying and totally devoid of life. Apparently, Hashima's buildings are deteriorating so rapidly that you can hear parts of the concrete collapse as the wind blows from the ocean. While we can't replicate those unearthly sounds on Google Maps, we can now give you 360° panoramas of the Hashima with today's launch of Street View imagery for the island. Thanks to assistance from Nagasaki City, we were able to collect imagery with the Google Trekker beyond the cordoned-off areas for tourists and into off-limits paths around the island. We also used our Business Photos technology to let you peek into the abandoned buildings, complete with ancient black-and-white TVs and discarded soda bottles. Engineers started refloating the deformed hull of the cruise liner Costa Concordia on Monday, a crucial step before its removal from the Tuscan island where it ran aground 30 months ago, taking 32 lives. “It’s a paramount engineering attempt not just for Italy, but for the whole world,” said Emilio Campana, the director of the research office for naval and maritime engineering at Italy’s National Research Council. The authorities said Monday that the first phase of the undertaking had been successful and that the ship was afloat for the first time since it hit a reef and capsized in early 2012, setting the stage for an operation unparalleled in the annals of marine salvage. A timelapse video filmed on Monday (July 14) shows the first day of the historic salvage operation to move the wreck of the Costa Concordia. 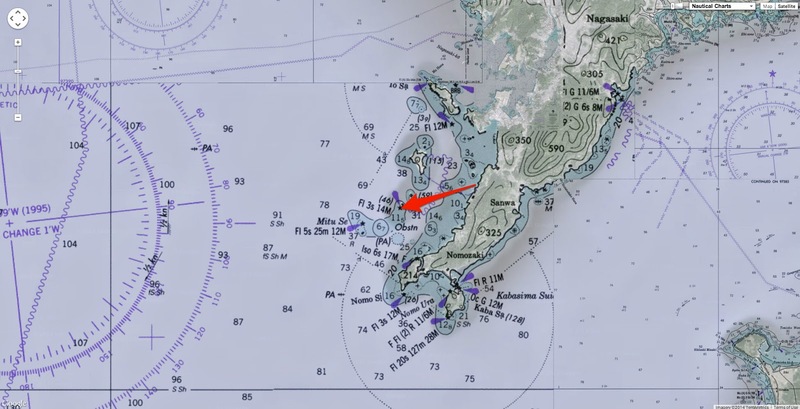 Filmed from the start of the operation on Monday morning until nightfall, the video clearly picks up the small zigzag movements showing that the 114,500 tonne Concordia was moving away from the coastline of Giglio Island. On Monday morning, the Italian authorities blocked the water and airspace around the island of Giglio, to ensure safety and prevent any interference with the refloating operation. In the first six or seven hours of the operation, the wreck will be lifted about seven feet using a pneumatic system, detaching the hull from a platform built nearly 100 feet underwater. The ship has been resting there since September, when engineers managed to right the ship in a spectacular 19-hour operation. Nick Sloane, the senior salvage master for Titan Salvage, the American company in charge of the operation, said Monday that he was relieved the weather was cooperating after a night of light rain. “Nervous? A little,” Mr. Sloane said to reporters on Giglio, according to the Italian news agency ANSA. Over the past few months, as the cost of the removal has swollen from the $300 million initially budgeted to more than $1 billion, workers have fitted 30 huge steel stabilizing containers, known as sponsons, on both sides of the Concordia that will function as floats. As pneumatic devices gradually empty the sponsons of water and fill them with air on both sides, the hull will be lifted upward. Over the next week, the ship will be raised deck by deck until only 50 feet remains submerged. At that point, the Costa Concordia should be ready to be towed away by tugboats — two at the bow and two at the stern — for its final cruise of nearly 200 nautical miles to the port of Genoa. An Italian official said on Sunday that once the ship is lifted, it will be thoroughly searched for the body of an Indian waiter, the only one of the 32 known fatalities from the accident that has not been recovered. Further complicating the salvage operation is the potential for environmental damage, particularly the leakage of fuel oil. “Of course we are worried about the refloating operation, as it is not entirely clear how possible leaks of the Concordia’s toxic liquids will be handled,” Alessandro Giannì, campaign director at Greenpeace Italy, said. After the ship leaves the Tuscan island, workers will begin the environmental recovery phase, which should last several months. Under the current plan, salvage workers will attempt to clean the sea floor and replant the rare marine flora that attracted recreational divers. 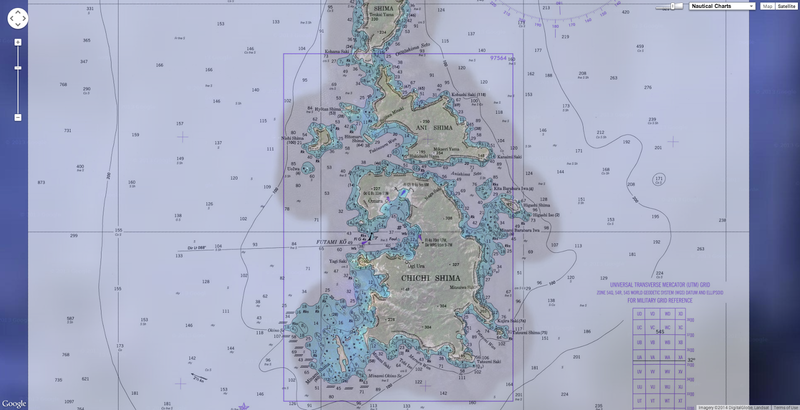 It was still unclear whether the underwater platform would be left on the island’s sea bottom and used as a diving facility or would be removed. The ship’s captain, Francesco Schettino, is facing trial on multiple charges of manslaughter, causing a shipwreck and abandoning the vessel before everyone had disembarked, and in recent months hundreds of witnesses have been giving testimony in court. A company official and four crew members have pleaded guilty to reduced sentences. The Superyacht Cup in Palma de Mallorca at the end of June 2014 was a fantastic event for all who participated. The first stunning and timelessly lined F-class yacht Firefly was launched in May 2011, the first in an exciting new series of F-class one designs. Combining the spirit of the J-class with the performance of a maxi racer, the design brief for these race classics called for the smallest sized vessel that could challenge a J on the water in both light and heavy winds. Take a couple of minutes out of your day and imagine being onboard Atalante, Heartbeat, Lionheart, Drumfire or Firefly. at Scripps Institution of Oceanography, UC San Diego in La Jolla, Calif. on July 8, 2014.
by Scripps graduate students Julia Fiedler, Sean Crosby and Bonnie Ludka. From a distance, the ocean near Scripps Pier off La Jolla, California, appeared to be the site of a catastrophic oil spill on Tuesday. Initially, Robert Monroe thought it was a red tide. Massive school of anchovies appears to be an oil slick. Making a long, dark cloud in the shallow water off San Diego County was a massive school of Northern anchovies the likes of which has not been seen hugging the coast in more than 30 years. Monroe, a communications officer with Scripps Institution of Oceanography at UC San Diego, saw the unusual sight and raced to the pier with a GoPro camera, according to the Los Angeles Times. “It was remarkable,” Monroe told the Los Angeles Times. “From a distance it looked like an oil slick and you think, ‘What happened?’ and then you get up close and it’s amazing. A massive school of anchovies initially looked like a red tide to Robert Monroe of Scripps. Phil Hastings, a marine biologist professor and curator of the Scripps Marine Vertebrate Collection, told City News Service the millions of anchovies were first spotted Monday by lifeguards, but they were mostly dissipated by Tuesday evening. “Leopard sharks [one is seen in the video] were feeding on them this morning,” Hastings told CNS. The Scripps Marine Vertebrate Collection collected specimens so they could be studied, but Hastings told CNS that he doubted the mystery of the baitfish’s appearance along the shore would ever be solved. Flickr : A huge school of anchovies travels through waters off the coast of La Jolla, CA on July 8, 2014.